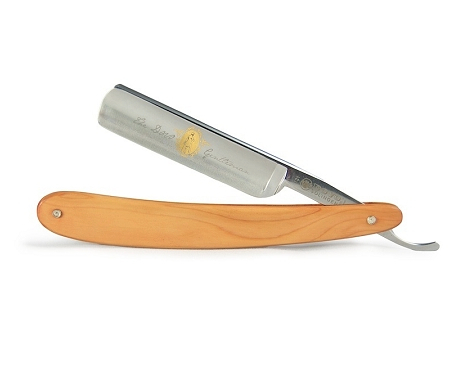 Dovo “The Gentleman” 5/8 inch Yew Wood straight razor has a full hollow ground carbon steel blade with round point. Dovo has really upped their game lately and released a number of outstanding straights in 2012. The quality control has tightened, they hone easier and hold an edge longer. The high performing steel is adorned with etched “The Dovo Gentleman” and a gold wash logo. This wonderful blade is finished with yew wood scales. Markings: Gold wash logo. Etched “The Dovo Gentleman”.